In what fans hope will be a preview of things to come for this afternoon’s INDYCAR Grand Prix at the Indianapolis Motor Speedway, Colton Herta won an outstanding duel between he and Santiago Urrutia to sweep both Indy Lights rounds this weekend. Stalking Urrutia for multiple laps, Herta attempted passes on the inside and passes on the outside of the Belardi Auto Racing driver. Saving his push-to-pass allotment until the very end, Herta committed to one final move with just a couple laps remaining. Both drivers held their ground and it appeared Urrutia ran Herta off the track a bit, though the Andretti-Steinbrenner driver fought back and showed his stubbornness through Turns 1 & 2. After being forced into the grass, Herta re-asserted his position and merged back onto the track after running a couple tires off of the tarmac. Seconds later, the two drivers came together and Urrutia went around. Herta would escape the spin zone without much incident and proceeded to coast home to victory. While yesterday’s win was an impressive performance, Herta certainly earned a bit more respect both on and off the track by not letting Urrutia push him around. That plus the victory can go a long way for the confidence of a developing driver. When the dust had settled on the rest of the race, hard luck Aaron Telitz had finished runner-up and reigning Pro Mazda series champion Victor Franzoni rounded out the podium. Behind them, Urrutia ended up fourth while Ryan Norman (5th), Dalton Kellett (6th) and Pato O’Ward (7th) rounded out the compact field. 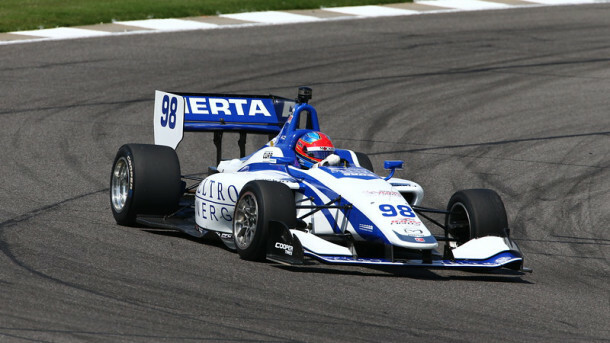 The stars of Indy Lights will be back in action on Miller Lite Carb Day, Friday, May 25 with the Freedom 100. It will be round seven of the 2018 championship.